The Sprint Samsung Galaxy S III SPHL710KTS Cell Phone offers a variety of applications from the Android Market that you can use in your daily life as it runs on the latest Android 4.0 operating system. It’s able to make swift work of running tasks and apps at the same time thanks to the built-in 1.5 GHz Dual-Core processor. You’ll be able to view your contents clearly and navigate your phone seamlessly on its beautiful 4.8″ HD Super AMOLED touchscreen. The Sprint Samsung Galaxy S III SPHL710KTS Cell Phone includes 16GB of internal storage for saving tons of files and other multimedia content. You can also captures high-quality photos and videos using its 8MP camera. This excellent phone even provides Wi-Fi functionality so you can enjoy seamless wireless networking wherever you go. Optimized for peak performance, the Android-powered Samsung Galaxy S III from Sprint offers one of the most sophisticated interactive mobile experiences to date. You’ll be able to send photos, videos, and information easier and faster than ever while staying in close connection to friends and family members from wherever you are. Delivering impressive processing power to allow more applications to be accessible simultaneously, the Galaxy S III also features a brilliant 4.8-inch display that extends to an ultra-thin bezel to maximize the viewing area. The expansive display is also protected by Gorilla Glass 2.0 to guard against cracks and scratches and provide enhanced touchscreen responsiveness. 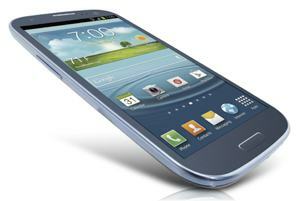 The Galaxy S III runs the Android 4.0 operating system (a.k.a., Ice Cream Sandwich), bringing a redesigned user interface with enhanced multitasking, notifications, full Web browsing experience, and more. You’ll also enjoy innovative, next-gen features such as Face Unlock, which uses facial recognition to unlock the Galaxy S III, and Near Field Communications (NFC) capabilities. Going beyond simple point-and-shoot photography, the 8-megapixel rear camera offers a Burst Shot mode that captures still pictures at a rapid-fire pace at three images per second with zero shutter lag, and its Best Shot feature recommends the best picture to keep based on colors, lighting, and clarity. It also records Full HD 1080p video with a backside illuminated sensor that improves performance in low light environments–and you can even capture a photo while shooting video. Note: The Galaxy S III is able to access the Sprint 4G LTE network, available in limited markets. 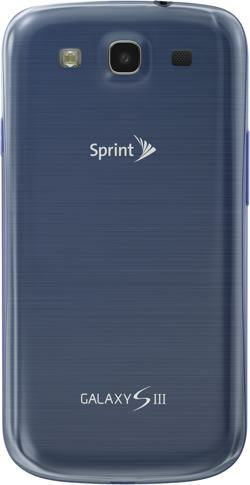 This phone is also compatible with Sprint’s nationwide 3G network. With Google Wallet, you can transform the Galaxy S III smartphone into a smart wallet using Near Field Communication (NFC) to make safe purchases at more than 100,000 participating retailers–including Bloomingdales, Toys “R” Us, CVS, Gap and Macy’s. Connect Through Touch: With S Beam, just place two Galaxy S III phones back-to-back and you can transfer photos, videos, documents, and more. In just three minutes you can successfully share a 1 GB video file–it’s fast, easy, and you don’t even need a Wi-Fi or cellular signal. Send Pictures in a Flash: Thanks to Buddy Photo Share, the Galaxy S III recognizes the faces of your friends, so it can share photos with them right away. And with Share Shot, you can send photos to all your party guests so everyone leaves with snapshots of the event. Access Content on Multiple Devices: Through AllShare Play, you can share files with other devices and access those files on various devices, such as documents or multimedia files between your Galaxy S III phone and a tablet, PC, or television. With AllShare Group Cast on the Galaxy S III and a Wi-Fi network, you can share and collaborate on documents, presentations or images in real-time with multiple friends or co-workers without loading the file separately. Let Your Eyes Control the Display: Thanks to the Smart Stay feature, the screen display will remain bright as long as you’re looking at the phone. Set it down, and it dims instantly. Because the front-facing camera can identify your eyes–while reading an e-book or browsing the web, for instance–it recognizes how you are using your phone and provides a bright display accordingly. Tell Your Phone What to Do: The S Voice feature enables the Galaxy S III to actually listen and respond to your words: tell it to wake up, snooze, take a photo, answer a call, send a text message, or play a favorite song. The Samsung Galaxy S III weighs 4.7 ounces and measures 5.4 x 2.8 x 0.3 inches. Its 2100 mAh lithium-ion battery is rated at up to 9.2 hours of talk time. It runs on Sprint’s 3G (800/1900 CDMA/EV-DO Rev. A frequencies). Sprint’s 4G LTE network is available in limited markets. The Galaxy S III runs the Android 4.0 operating system (dubbed Ice Cream Sandwich), which adds powerful new ways of communicating and sharing while improving on the best Android features: easy multitasking, rich notifications, customizable home screens, resizable widgets, and more. 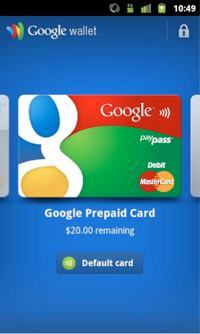 Compatible with Google Wallet (view larger). You can now unlock your phone with just your face using the Face Unlock option. It takes advantage of the front-facing camera and state-of-the-art facial recognition technology to register a face during setup and then to recognize it again when unlocking the device. Just hold your phone in front of your face to unlock (or use a backup PIN). And the lock screen now lets you do more without unlocking. From the slide lock screen, you can jump directly to the camera for a picture or pull down the notifications window to check for messages. When listening to music, you can even manage music tracks and see album art. Quickly access related apps right from the home screen by organizing apps and shortcuts into folders–just drag one app onto another to create a folder. Multitasking is even easier and more visual in Android 4.0. The Recent Apps button lets you jump instantly from one task to another using the list in the System Bar. The list pops up to show thumbnail images of apps used recently–tapping a thumbnail switches to the app. The new voice engine in Android 4.0 lets you dictate the text you want, for as long as you want, using the language you want. You can speak continuously for a prolonged time, even pausing for intervals if needed, and dictate punctuation to create correct sentences. As the voice input engine enters text, it underlines possible dictation errors in gray. After dictating, you can tap the underlined words to quickly replace them from a list of suggestions. A short-range wireless technology similar to Bluetooth, Near Field Communication (or NFC) allows enabled devices to share information in close proximity. For example, you can “touch” or “swipe” an NFC tag that might be embedded in a poster, sticker, or advertisement, then act on the data read from the tag. You can also utilize NFC for contactless payment via Google Wallet. Instead of using cash or swiping a credit card, just touch your phone to an NFC payment reader and have your purchase deducted automatically. Store virtual versions of credit, loyalty and gift cards securely in Google Wallet, as well as coupons and offers that can be redeemed when you make a payment. You can make payments at hundreds thousands of locations nationwide where MasterCard PayPass is accepted. Wireless-N Wi-Fi networking (802.11b/g) for accessing home and corporate networks as well as hotspots while on the go. Built-in mobile hotspot functionality allows up to 10 Wi-Fi enabled devices to share the 3G or 4G experience on the go with a laptop, camera, music player, game unit, video player, or any other Wi-Fi enabled device. Next-generation Bluetooth 4.0 backward compatible with older Bluetooth-enabled peripherals and includes stereo audio streaming. Near Field Communication (NFC) for sharing contacts, web pages, directions, and more to compatible phones as well as payments via Google Wallet. GPS for navigation and location services Integrated Google Maps with turn-by-turn navigation, street and satellite views. Full messaging capabilities including SMS text, MMS picture/video and IM instant messaging Full HTML browser with Adobe Flash Support Personal and corporate e-mail access with support for Exchange ActiveSync as well as mobile e-mail accounts (Google push, Yahoo!, POP3, IMAP). 16 GB internal memory (non-expandable) microSD card slot with support for optional cards up to 64 GB. 2 GB RAM for improved multitasking. 8-megapixel camera with continuous auto focus, zero shutter lag, face detection, high dynamic range mode, burst mode, and more. Full HD 1080p video capture (30 fps) Front-facing 1.9-megapixel camera for HD video chats and self portraits.